Industrial Optics is a family-owned optical manufacturing company that takes great pride in providing consistent quality, American Made optics and outstanding customer service. Large or small, we value each and every one of our customer’s and aim to continually exceed their expectations in optical fabrication. 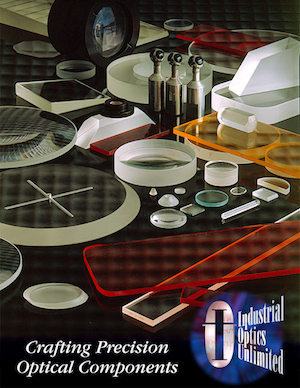 Whether your need is for optical prototypes or large volume optical quantities, Industrial Optics is here to meet your needs. Industrial Optics has been in the optical manufacturing industry since 1990 and is classified as a small woman-owned business. We continually improve our optical manufacturing processes to better serve the needs of our domestic and international customers. Our optics manufacturing team has many years of experience in fabricating optical components in both commercial and laser applications. During our hours of operation you will always reach a friendly customer service representative instead of a machine! We work with our customers on any type of JIT program or on blanket orders so we can keep your costs down. We perform 100% inspection on the items you order to eliminate any inconvenience to you, our customer.